Making Christmas dinner is always a fun day, and when the family is setting around eating and enjoying the offerings that you have made for them it’s always a very satisfying feeling. However, my favorite part of holiday cooking is making something new and different with the leftovers. Behold the holiday brunch buffet! Lets face it, you have a lot of leftover food, and at some point making a sandwich for the fourth time, no matter how good the ham is gets a little old. So spice it up a little and make a leftover frittata. 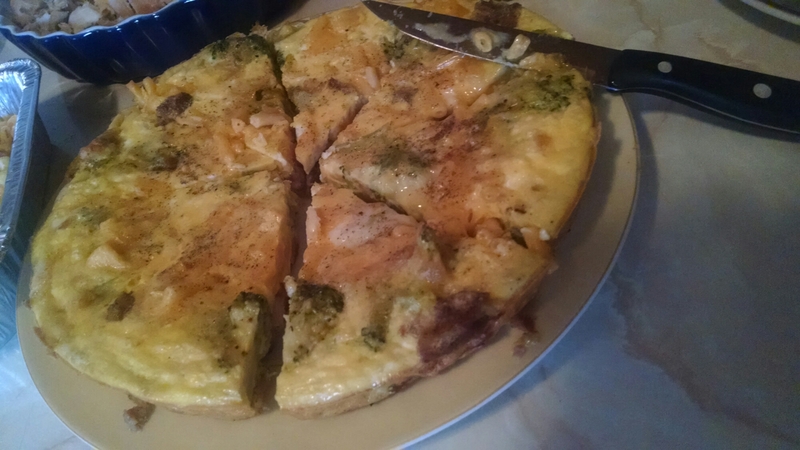 You can really use anything in a frittata dependent upon the leftovers you have in the fridge. Start by preheating your oven to 350 degree’s and putting a cast iron skillet on to the stove over medium heat, and add the butter so it will begin to melt. 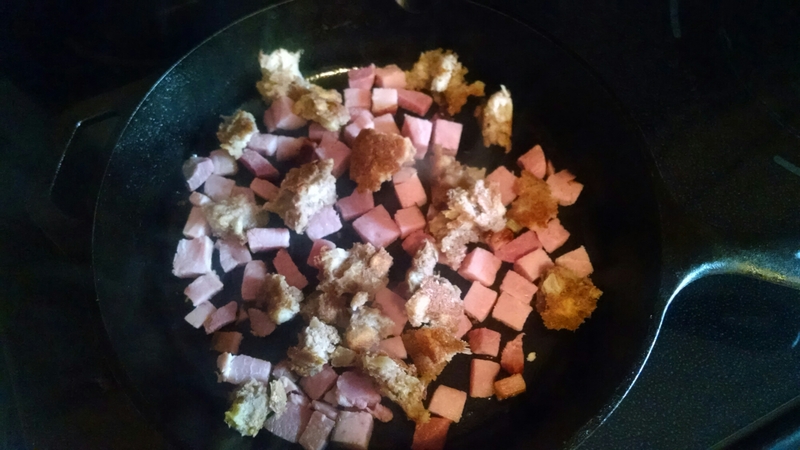 Cut enough of the ham up in to small pieces to cover the bottom of the skillet and place them in the skillet and allow them to start heating through. 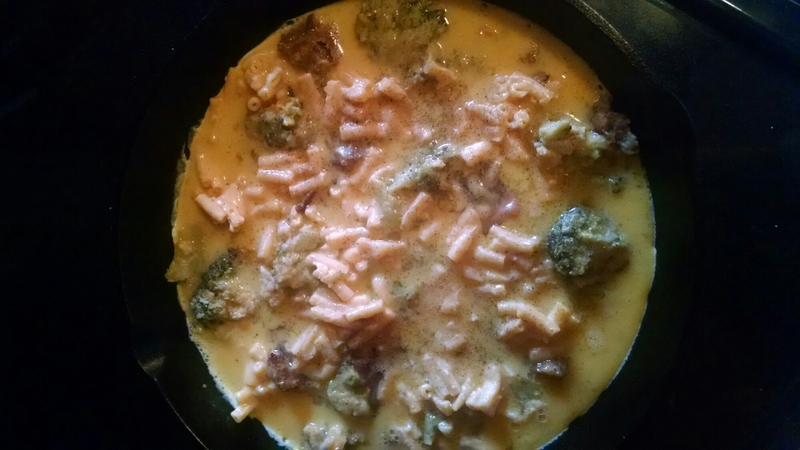 Add the spoonfuls of the leftover foods, broccoli casserole, mac and cheese, and dressing. Crack the eggs in to a bowl, season them with salt and pepper and then whisk them together. Stir the food in the skillet as it warms through, then level it off so that everything is about the same depth. Pour the eggs in the skillet making sure all of the cracks and crevices are filled in throughout the skillet. At this point it is really important to not touch anything in the skillet, just let the eggs begin to cook. Keep a close eye on the skillet as you should begin to see the eggs bubble in different areas of the skillet (5-7 minutes). When this happens, transfer the skillet to the oven and let it bake for about an additional 10-15 minutes. You will know that it is done when you grab the handle of the skillet and shake it back and forth and the center of the frittata is set. If it still looks loose, you need to let it cook for a few more minutes. Once it is cooked through remove it from the oven and place it on the stove top to allow it to rest/set. After about 8-10 minutes you will be able to run a spatula around the side of the frittata and take it out of the skillet in one piece and place it on a serving platter. Cut it in to however many pieces you like, and place the warm bowl of gravy beside of it. If your going to go for the full blown brunch buffet you may want to include some other items for people to chose from. I put out everything “cold” that we have leftover. 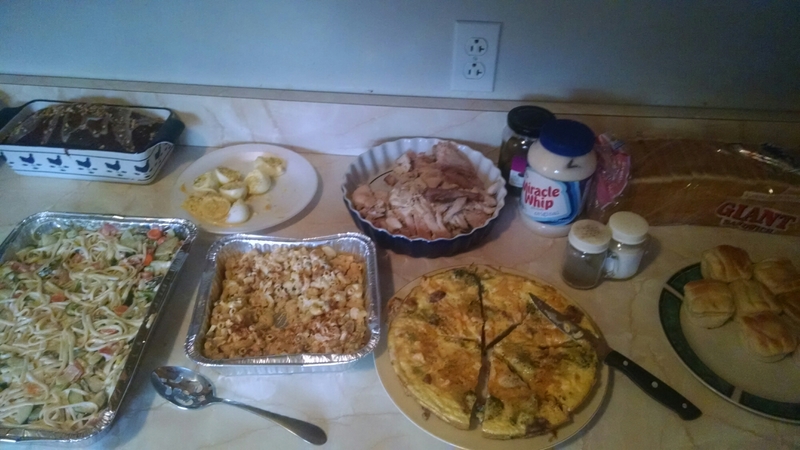 This morning it was pasta salad, macaroni salad, deviled eggs, cold turkey, which I also put a loaf a bread out, miracle whip, and pickles to make it easy to build a cold turkey sandwich. And of course you have to have some dessert options. This part of holiday cooking means as much to me if not more than the big dinner does. This is an opportunity for just those of us who live in the house to have another chance to eat a special meal together. It’s very little work, and worth a lot more than the effort you have to put it to it. Keep in mind that there aren’t really any set rules for making the frittata, I make these all the time using a wide variety of ingredients and following the same steps listed above. Give something like this a shot before everyone in the house goes back to the day to day work schedule, school or whatever else you have going on that takes away from time together.